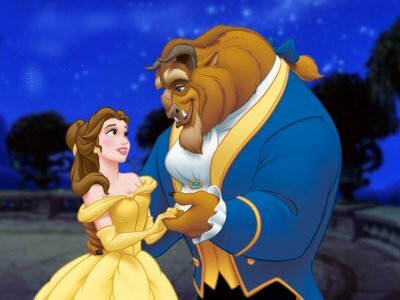 One of the standouts of the ten-year ‘Disney Renaissance,’ a period that saw the release of some of the Disney’s finest and most enduring animated works, 1991’s animated musical Beauty and the Beast rivals anything the studio released during their venerated Golden Age. For those in need of a quick refresher, the protagonist is a free-spirited young woman named Belle (expertly voiced by the Broadway singer Paige O’Hara). Something of an oddity in her parochial hometown, Belle must continually refuse the advances of the arrogant and dim-witted village hero Gaston, and cares deeply for her father, the eccentric inventor Maurice. When Maurice loses his way in the forest late one evening, he stumbles across the castle occupied by the titular Beast, who isn’t the sort of fellow to welcome in uninvited guests. The hairy, razor-toothed fellow, who was once a handsome young prince, imprisons Maurice, leading Belle to come rescue papa and break the curse which ensnares the hapless Beast. Along with Aladdin and The Lion King, Beauty and the Beast is one of the hallmarks of Disney’s entire century-long canon. It was the first animated film to be nominated for an Academy Award for Best Picture, and in addition to several Golden Globes it also garnered Oscars for Best Music and Best Original Song. The characterisations are excellent and the storyline, based on a centuries-old fairy tale, is an engrossing one that deftly counters weight with whimsy. A true artistic and commercial triumph, the film has truly been given the red carpet treatment with the current three-disc Diamond Edition. In addition to a smattering of extras Disc One contains stunning HD renditions of both the theatrical and extended editions, this latter running almost a full half-hour longer thanks mainly to an extended alternate opening act. 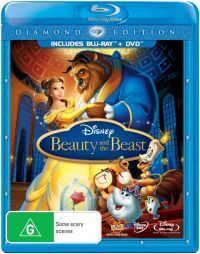 Disc Two is absolutely brimming Blu-ray special features, principally the superb, hours-long ‘Beyond Beauty: The Untold Stories Behind the Making of Beauty and the Beast.’ Lastly Disc Three contains the DVD edition of the film, with an audio commentary and singalong taken from the Blu-ray version. Overall the Diamond Edition stands as an incredibly rewarding, eminently impressive and surely definitive release of this animated classic. The feature itself looks breathtaking on Blu, and for those looking for reasons to make the transition to the HD format, surely this is it. Stunning stuff. There’s nothing beastly about picture quality on this Diamond Edition; the HD transfer of this Disney classic is, quite simply, the reason Blu-ray was invented. It’s one of the most flawless, stunning prints we’ve ever seen, with impeccable vibrant colorisation, impressive depth and a startling amount of detail aided by a 1.78:1 aspect ratio, which is the perfect compromise between the 1.85:1 of previous editions and the 1.66:1 we grew up watching on battered VHS editions. Boffins at the House of Mouse evidently felt a 5-channel surround audio mix simply wasn’t enough for to keep pace with the magnificent visuals: the feature comes with a DTS-HD MA 7.1 soundtrack. This is probably overestimating the capabilities of most home theatre setups, but it’s nonetheless the definitive rendering. The 3-Disc Diamond Edition is positively laden with supplementary material. As befits a release of this calibre the bonus content is first rate, and much of the content, such as the previously unseen short films included on the touted Beyond Beauty featurette, is of genuine historical interest. In addition to the Blu-ray and DVD versions of the feature, included are two lengthy deleted scenes (including an 18-minute alternate opening), audio commentaries, conversations with animators and composers, insights into all stages of the creative process, games, music videos, animation tests, featurettes and a comprehensive 6-act Making Of. All special features are presented in 1080p High Definition, and all up the set includes a vast amount (some seven hours, by our count) of thrilling and well-chosen bonus content.